Nürnberg is the largest city in Franconia, the northern part of Bavaria, and the economic centre of the Metropolitan Region (EMN). Several well known companies have their headquarters in Nürnberg. Gingerbread, electronic and high-tech products, beer, stationary supplies and toys are some of the products produced here. Nürnberg, situated about 170 km North of Munich, has a population of 490,000 (1.1 million in the agglomeration) and therefore is the second largest city in Bavaria. The unmistakable face of Nürnberg’s city-centre is moulded by the mostly rebuilt historical buildings, patrician houses, churches, the castle and the city walls, which give it a medieval atmosphere. The surrounding countryside with its lakes, hills, river valleys and villages offers many possibilities for leisure activities and weekend-trips. Nürnberg, lying in the very centre of Europe, can be easily reached from anywhere. The international airport is only seven kilometres away from the old city, the motorway-network and the Intercity’s hourly service links Nürnberg with the rest of Europe. The Friedrich-Alexander-University Erlangen-Nürnberg (FAU) was founded in 1743.The four classical faculties – Theology, Law, Medicine and Philosophy – have been in existence since then. Since the 1960s the range of faculties of the university has become wider and wider. The School of Trade and Commerce (founded in 1919) was renamed The Department of Economic and Social Science in 1961. This made the FAU – together with the introduction of the Technical Faculty in 1966 – a modern, future-orientated university, perfect for education with a well-balanced mixture of traditional and innovative fields of research and teaching. Moreover, over the last decades, the University has established its reputation as ahttps://www.fau.de/2012/11/news/panorama/leiden-crown-ranking-fau-deutschlandweit-im-spitzenfeld/ in cutting-edge research. It is firmly anchored in a close network of interdisciplinary co-operations. These include partners from industry, specialised non-university research centre and a number of leading international universities. Within the Metropolitan Region Nuremberg, FAU likewise plays an important role as employer, generator of innovations and centre for education. 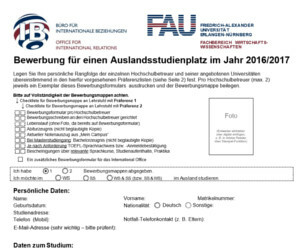 Due to the close connections between research and teaching, students at FAU receive a well-founded academic training in an inspiring environment. The School of Business and Economics (former: WiSo) has around 34 chairs and 5,500 students in the fields of Business Administration, Economics, Law, Social Sciences, Business & Education and Business Computer Science. We are forming a new Faculty since 2007 with the Law School in Erlangen. Students pick their subjects from a wide variety of choices offered by the different chairs. The BA studies should be finished in six semesters; the MA studies usually take another two years. Successfully graduating, the diploma will be hand out to the students. The faculty started its international programms in the 70s, and today has got around one hundred close ties to other business schools all around the world. Since then, our international exchange students have grown to become an integral element of our faculty’s teaching.